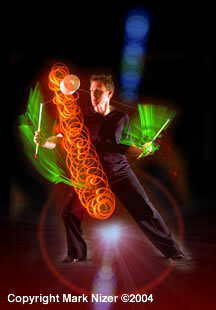 Mark Nizer's invention of the Laser Diablo merges juggling, light and technology into the coolest thing you'll ever see. Imagine 4 lasers being juggled at a 1000 rpms with the spinning laser beams dancing just above the audiences heads. You'll see why Performance Magazine called his show "nothing less than brilliant". Using a fog machine or hazer; watch the stage and show jump right out into the audience. 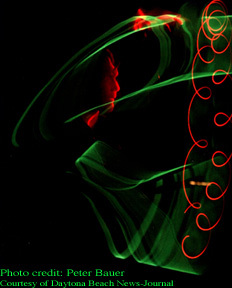 A laser show with out a computer running a preset program. Mark brings a performance aspect that no machine can duplicate. Laser Diablo® is a trademark of Mark Nizer Company.